This downloadable resource for educators can be used to guide classroom discussions about The Inventors at No. 8 or spark ideas for independent projects. It includes pre-reading questions, group discussion questions, a brief biography of Ada Byron, and STEAM activities suitable for grades 3-6. Assemble your very own decoder ring to send secret messages to your friends and allies. Print the image to the left and grab a pair of scissors and 1 brad (not included). Follow the instructions to learn how to clandestinely communicate important information. Practice using your secret decoder ring to solve these clues from the book. 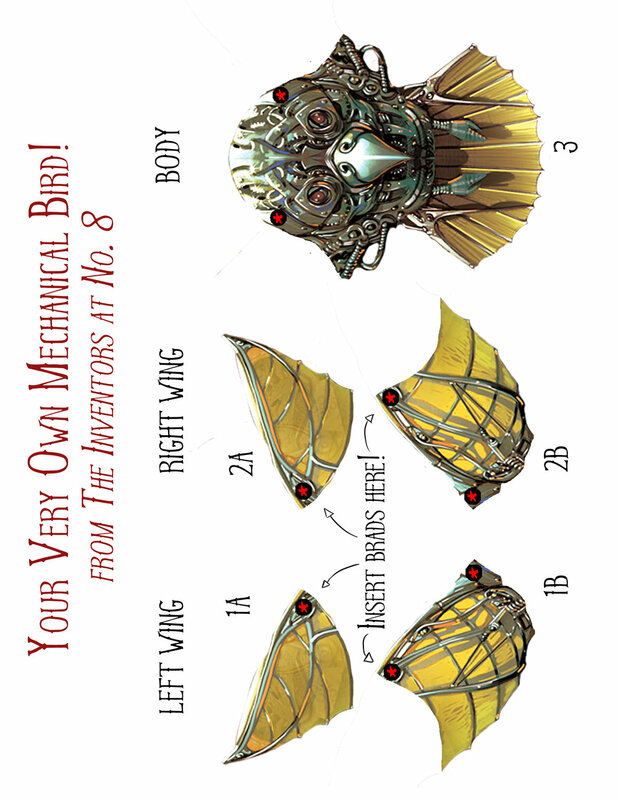 Make your very own mechanical bird just like the one Ada invented! Print out the image to the left. Cut out the pieces and attach them using 4 brads (not included). Instructions below. Follow these instructions to assemble the mechanical bird above. The British characters in the book won't celebrate the holiday with you, but you can still have some fun with this messy, outdoors 4th of July experiment. Follow the instructions to make a fizzy rocket with just a small canister, water, and alka-seltzer tablets. Don't forget your safety goggles!